For some reason I love the idea of giant sea creatures. All those in search of the giant squid shows on the Discovery Channel – watched them. Ditto when they bust out the giant octopus stuff – I’m there. I don’t know what about them that I like so much. Perhaps, oddly, it’s the romanticism of the giant sea creature. I know it sounds funny, but for some reason a giant sea squid makes me think of multi-masted ships getting taken into the briny deep for venturing off the map. The ocean is still so vast that we continually discover new things living there. And that although doubtful, I can still entertain the idea that one day I’ll be watching BBC America news in the morning (because it’s back!) and hear a neutral voice with a British accent explain that a ship has been destroyed off the coast of some country by some giant tentacled thing from the deep. This brings me to the lusca. It is said by some, and by some I mean cryptozoology fans and Bahamian tourist websites, that in the blue holes (vertical caves) of the waters off of Andros, which is an island in the Bahamas, you may find the lusca. The lusca seems to generally be described as a giant, massive octopus, but like all creatures that end up of legend, it also has been described as half octopus, half shark, or as a multi-headed creature reminiscent of a dragon. 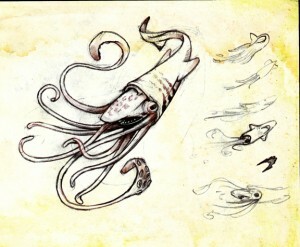 The scientific community, when feeling generous, will say that perhaps the lusca is an example of a colossal squid, or giant octopus, but since the stories put the size at anywhere between 75 to 200 feet long, most find the idea of the lusca existing in it’s traditional dragonish, shark/octopus, form unlikely. Of course there will always be those, who like me, keep awaiting the return of the giant mythical sea creature. We have a resurgence in piracy, can the creatures that accompany the pirate mythos be that far behind?